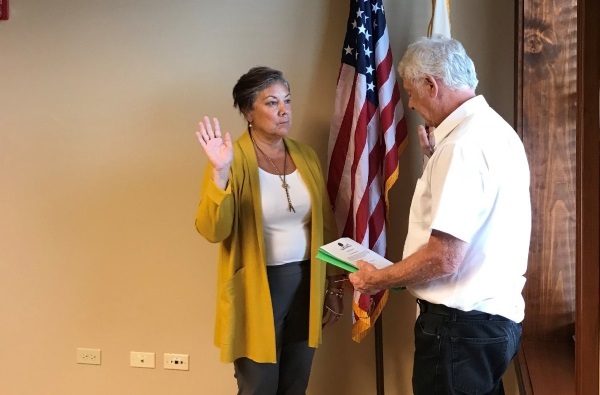 “There is not many things that someone my age hasn’t experienced, but this is new and this is exciting!” said Wendy WhiteEagle, 58, who was sworn into her seat as a Trustee of the Village of Campton Hills in Illinois on August 31, 2018. Campton Hills is a growing community just west of Chicago in the western suburbs and boasts a population of nearly 20,000 residents. White Eagle is a member of the Ho-Chunk Nation, who is part of the Eagle Clan. Her parents were John H. White Eagle and Lyla L. Miller. She grew up in Madison, WI where she earned her bachelor’s degree from Edgewood College and master’s degree work in the Executive MBA program with UW-Madison and Edgewood College. White Eagle was appointed by Village President and Board Chair Harry Blecker after another Trustee resigned in July. White Eagle believes she is well equipped for her job saying, “I have had many leadership positions throughout my career and strongly believe that one of the aspects of my performance that has consistently stood out is my ability to build teams. I have deep knowledge in the finance, organizational development, and management arenas which I now believe I can leverage into my public service.” Currently, White Eagle is the President and CEO of Native Capital Investment, INC. headquartered near the Village and has held that title for over 15 years. In her role as President she is able to work with local businesses both inside and outside the village in creating self-sustaining business and communities. This objective is easily transferrable into her role as a trustee of a fast growing suburb. In the past 8 years, the Village has seen tremendous growth. In 2010 at the census the population was 11,310 residents. Since then, the population has grown to 17,564. This is driven not only by population relocating from the City of Chicago, but also large commercial growth within the township. The location of the Village is close enough to the City of Chicago that growth is expected to continue. In this role, White Eagle hopes to help create a community that is in demand as her Village grows forward, together saying, “As we expand our vision of what makes community I believe we can also leverage both human capital and local resources to create a shared sense of place. Collaborating, even in this microcosm that is our Village, will allow for diverse voices to be heard and for plans to be made as we grow forward, together.” As a member of the Ho-Chunk Nation, White Eagle makes up less than 0.5% of the Village’s Native American population. However, she now has a seat at Board table to guarantee the diversity of the village has a voice.